Signed Caroline Wozniacki Memorabilia, Tops, Shirts, Racquets, Caps, Photos. Shop our Signed Caroline Wozniacki Tennis Memorabilia, autographs & signed tennis gear. Tennis racquets, tennis balls, tops, shirts, photos and tennis balls carrying the players signature. Free UK delivery, a certificate of authenticity and worldwide shipping on all items, many with signing proof. 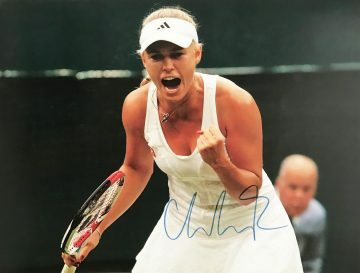 Buy signed tennis memorabilia autographed by former world number one Caroline Wozniacki here at Firma Stella, with our carefully curated collection of ephemera autographed by the tennis star. With an Australian Open win and a number of WTA titles under her belt, she was the first woman from a Scandinavian country to hold the top ranking position during the Open season. Despite her relatively young age of 28 she shows no signs of stopping yet – as she continues to compete at top level. Wozniacki started playing tennis aged 10. Both her parents were avid sports players – her father Piotr was a professional football player, whilst mum Anna played for the Danish national women’s volleyball team. Her father became her primary coach when she was 14, guiding her through to professional tennis with the assistance of a number of professional coaches including Sven Groeneveld and Ricardo Sanchez. In 2005 Caroline made her WTA debut, following superb success on the junior circuit – taking her first WTA title in 2008. Just a year later she featured in her first Grand Slam final, rising through the ranks to the top five. In 2010 and 2011 she was ranked world number one, thanks to a number of incredible wins in Open and WTA competitions. In total Wozniacki has one Grand Slam win under her belt – at the Australian Open in 2018. She has reached the Quarter Finals of the French Open and been a finalist at the US Open twice. Her incredible achievements are made all the more marvellous considering the way Wozniacki has continued to excel in the face of adversity. In 2018 she announced that she had been diagnosed with Rheumatoid Arthritis just prior to the US Open but played through it. Despite a small drop in results post-diagnosis she has bounced back to form very quickly – and wants to become a role model for others with the condition. Our Caroline Wozniacki signed rackets, balls, shirts, tops, caps, visors and other memorabilia is second to none – featuring a variety of extra-special items autographed by one of tennis’ most prolific rising stars. Browse and buy today – each item is supplied with a certificate of authenticity.